5 Tips for Dockboard Safety & Handling | Koke Inc.
Before each use, you should make sure that your dockboard is capable of supporting the maximum intended load. This includes not only the weight of the load, but material handling equipment like forklifts and the employees that will be handling that equipment. We recommend determining the minimum capacity of your dockboard by multiplying the capacity of the highest capacity vehicle to be used on it by three. We offer a variety of dockboards to match the specifications of your dock. To determine the proper length of your dockboard, you will need to know the Height Differential (height of the highest trailer minus the dock height) and the Type of Loading Equipment being used. Using our Dockplate & Dockboard Selection Guide, match your height differential to our list of minimum lengths. As for width, we recommend a dockboard to be at least 12 inches wider than the overall width of the equipment or pallet used, as wider boards increase maneuverability. Treat each loading experience as if you’re using the dockboard for the first time. Inspect your dockboard thoroughly to insure it’s safe to use. This includes checking for any signs of damage including cracks, missing nuts or bolts, faulty locking legs/span locks, or disfigured side curbs. If you do find a problem during your inspection, DO NOT use the dockboard. Have you taken the steps to secure the unloading area? Ensure the dockboard is centered and that locking legs and span locks are secure. 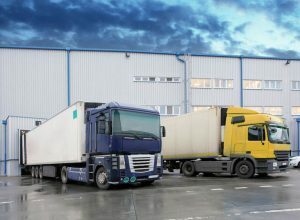 Also, dockboards should only be used when the wheel chocks/dock locks and truck/trailer restraints are in place, or else the truck and trailer may shift during loading. Dockboards are quite heavy pieces of equipment, and for that reason workers should never try to move a dockboard by themselves. For that reason, it’s best practice to follow the buddy system and use team-lifting techniques to prevent injury. Many dockboards come equipped with lifting handles to help with manual lifting and some even have lifting eyes for forklift lifting. We offer a variety of lift accessories such as lift chains, forklift loops and notched pockets. Need help picking out the right dockboard for your business? Koke Inc. has been ensuring the safety of warehouses all across the country since 1972. If you’re interested in speaking with one of our knowledgeable reps about any of our products, please call us at 800-535-5303.